This unique collection applies globalization concepts to the discipline of archaeology, using a wide range of global case studies from a group of international specialists. The volume spans from as early as 10,000 cal. BP to the modern era, analysing the relationship between material culture, complex connectivities between communities and groups, and cultural change. Each contributor considers globalization ideas explicitly to explore the socio-cultural connectivities of the past. In considering social practices shared between different historic groups, and also the expression of their respective identities, the papers in this volume illustrate the potential of globalization thinking to bridge the local and global in material culture analysis. 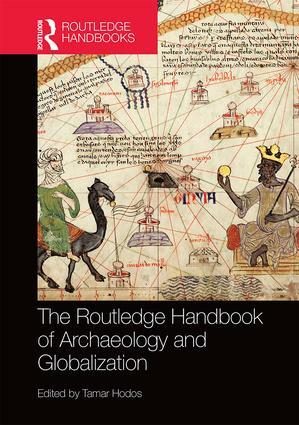 The Routledge Handbook of Archaeology and Globalization is the first such volume to take a world archaeology approach, on a multi-period basis, in order to bring together the scope of evidence for the significance of material culture in the processes of globalization. This work thus also provides a means to understand how material culture can be used to assess the impact of global engagement in our contemporary world. As such, it will appeal to archaeologists and historians as well as social science researchers interested in the origins of globalization. 5.3. Prehistoric Networks across the Korea Strait (5000-1000 BCE): ‘Early Globalization’ during the Jomon Period in Northwest Kyushu? Tamar Hodos is Reader in Mediterranean Archaeology in the Department of Archaeology and Anthropology, University of Bristol.